This has been a long time coming. For over half a decade we have been wanting to overhaul our website and make it more representative of the totality of Africa Media Online. In the past, our website was dominated by the media library side of our enterprise and the digital trade route side of the business very much took a back seat in terms of prominence. While the picture library is still front and centre on the home page of the new site, all our other products and services also feature strongly too. This will hopefully give a more balanced picture of who we are and what we are up to. What we call the “digital trade route” side of our business includes all that we do to assist institutions, organisations and individuals to get their collections (of photographs, manuscripts, audio and video content) from their cupboard (or wherever it is stored) to the audience they want to reach. This “trade route”, then, includes consulting, training, digitisation services and the provision of digital asset management services. And where appropriate, that is extended to licensing content on behalf of organisations. That is where the media library side of the business comes in. 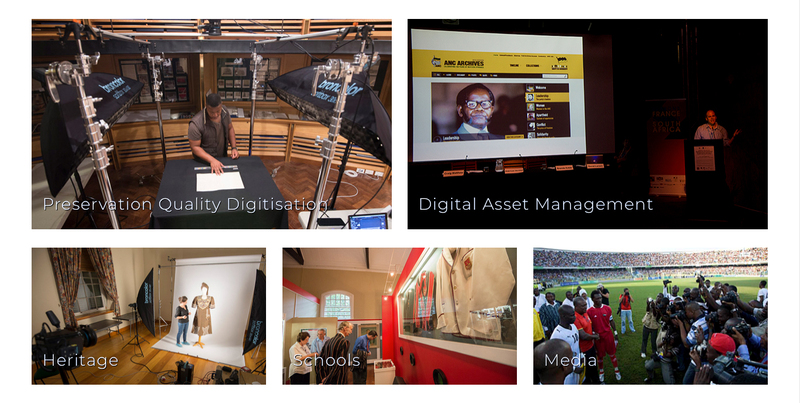 On the Digital Trade Route side of the business, we speak to clients not just about digitisation, but more significantly about building a digital archive, because ultimately that is what we help clients build. Digitisation in itself is only one step toward building a digital archive. And if your collections are born digital, then digitisation is not needed, rather digital processing is. But at the end of the day, you want all those digital files to end up on a digital archive where they are not only preserved for generations to come, but they are also made available in a secure and engaging manner to your community or your audience. For this reason we have included a whole section on the new website about digital archiving, seeking to give real answers to the reason for building a digital archive and the challenges faced in doing so as well as the solutions we have developed. We would welcome any feedback you may have on our website. Feel free to email me on editor@africamediaonline.com.